Questions have been raised about the possibility of an engine oil filter trapping the anti-wear engine oil additive ZDDP, thereby reducing the value of ZDDPlusTM. The fact is for the past 60 years, ZDDP alone has been used successfully as an EP (Extreme Pressure) lubricant additive in engines with a wide range of oil filters. Common sense says this fact alone raises serious doubt that an oil filter could trap ZDDP. However, let’s look at both oil filters and the structure of the ZDDP molecule in order to find a scientific answer to the question. Most filters are rated by the size of particles in μm (micron) they will trap, and the efficiency with which they trap those size particles. One micron is equal to one-millionth of a meter or 39-millionths of an inch. The filtration system in a typical engine works by pumping oil under pressure through a restrictive (less than 100% open area) porous surface in an effort to trap the particulate matter larger than a certain size. If the pores in the filter media had only round pores of the exact same size, it would have an extremely high efficiency at filtering out spherical particles just barely larger than the size of the holes. The filtering efficiency would be practically zero for spheres below this size, which would pass right through. In reality, the pores in the filter, as well as the particulates to be filtered out, are irregularly shaped. This gives the filter the characteristic of trapping different size particles at different efficiencies. For instance, depending on whether a football-shaped particle presented its long or short axis to the pore, it may pass through or become trapped by that pore. Although there are many variations in oil filter design, the very best contemporary oil filters claim to be capable of trapping around 99% of particles over 30 μm in diameter, 97% of the particles over 10 μm in diameter, and 95% of the particles over 5 μm in diameter. Our first approach to analyzing ZDDP and filters will be to compare the maximum possible size of the ZDDP molecule to the average 5 micron filter pore size. ZDDP (zinc dialkyldithiophosphate) has the chemical formula Zn[S2P(OR)2]2, where R is an alkyl group. Figure 1 is a basic diagram of a ZDDP molecule: The R and R’ components are alkyls, which are typically saturated linear-chain alkanes. In the actual ZDDP molecule, as in most organic molecules, the atoms do not line up in a straight-line configuration. There are well-defined angles at which atoms attach to each other, and which will create a 3-dimensional configuration like the depictions in figures 3 and 4. In order to make our example a worst case scenario and give the filter hypothesis benefit of the doubt, we will imagine our ZDDP molecule is laid out in a linear configuration. If this imaginary linear ZDDP molecule is much smaller than a pore in a filter, then an actual ZDDP molecule with the atoms arranged more compactly in a 3-dimensional configuration will be smaller still. In order to estimate the size of this imaginary linear ZDDP molecule, we need to first define the bond lengths between the atoms. Bond length is defined as the center-to-center distance between the nominally spherically symmetric atoms. 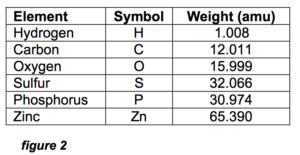 The MRC Handbook of Chemistry and Physics,1 gives 0.2 nm (1 nm = .000000001 meter) as a good estimate of the typical bond length of the atoms involved in the ZDDP molecule, whose constituent elements and their symbols are listed in figure 2. These symbols will be used exclusively in the following text. Figure 2 also shows why the mass ratio of P-to-Zn in ZDDP is 0.95:1. Since each ZDDP molecule has 2 P and 1 Zn atoms, the mass totals are 61.948 amu (atomic mass units) for P and 65.390 for Zn, which is a 0.95:1 ratio. Any deviation from this ratio in an oil analysis means some of the P or Zn is from another source, not ZDDP. 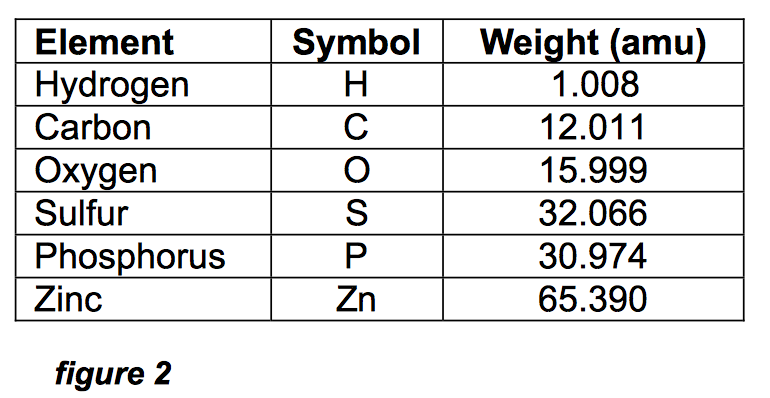 Back to the ZDDP molecule size analysis; C-C bonds are around 0.15 nm and C-H bonds are around 0.1 nm. The 0.2 nm bond length probably slightly over-estimates the sizes of all the above bonds between the atoms in ZDDP, so we will use it in order to give a largest-case estimate. 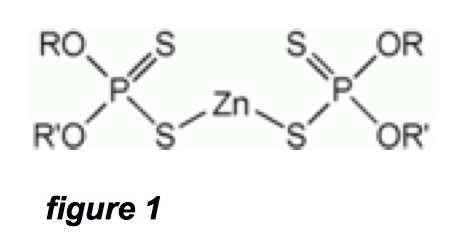 Referring to figure 1, the central part of the ZDDP molecule is well defined, and consists of 1-Zn, 2-P, 4-S, and 4-O atoms. Now, suppose this part of the ZDDP molecule is laid out O-P-S-Zn-S-P-O in a straight linear form. In reality it is not, but let’s continue with our worst-case analysis. This central part of ZDDP then consists of six 0.2 nm long bonds totaling 1.2 nm. 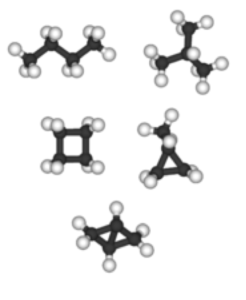 Referring to the left and right parts of the ZDDP molecule in figure 1, suppose the R and R’ molecules are 15 linear chain hydrocarbon molecules (alkanes, which are saturated forms like butane, octane, etc.) Thus, R and R’ have 14 bonds each 0.2 nm long. This equals around 3 nm for each R or R’ chain, and since there are two of these in a ZDDP molecule, the contribution to the size of the ZDDP molecule due to the R and R’ chains is 6 nm. Thus, the total length of our imaginary “linear” ZDDP molecule is 7.2 nm. 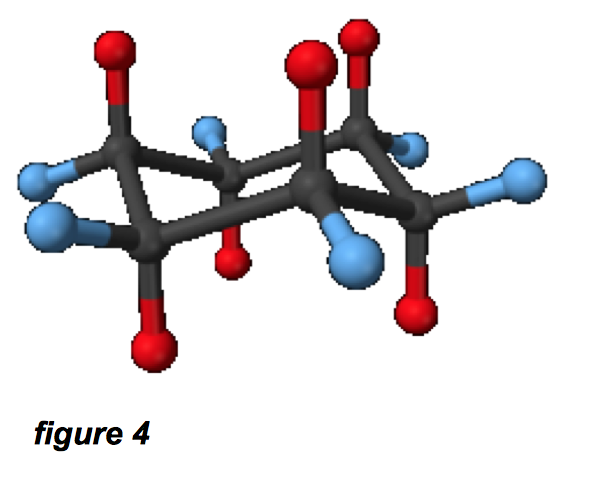 This is almost certainly an over-estimate, since the molecule will no doubt do some axis folding in 3-dimensional space, not to mention that some of the bonds above are at 45 degree angles. Wikipedia2,3 states that petroleum (mineral oil) is composed primarily of alkanes, cycloalkanes, and aromatic hydrocarbons. Alkanes are linear chains of single- bonded (typically) carbon atoms with hydrogen to saturate them; they also come in other isomers besides linear. Figure 3 depicts some typical small molecular weight alkanes. The cycloalkanes are the same composition, but form cyclic arrangements; cyclohexane (which is derived from the benzene ring), is depicted in figure 4. The red and blue atoms are hydrogen and the black atoms are carbon; this is called the “chair conformation.” In this configuration, we’re talking about a rough diameter of about 0.5 nm for the cyclohexane molecule. Based on this information, we can see the typical hydrocarbons in mineral oil will be between 0.5 nm and 5 nm in size, perhaps longer for high-molecular weight linear alkanes. This is very similar to the size of our imaginary linear ZDDP molecule. From the above, it is evident that ZDDP and oil molecules will be around 5-7 nm in size. Since typical automotive oil filters trap particulates in the 5-to-30 micron range (5000 nm to 30,000 nm), we see that even the hypothetical linear ZDDP and oil molecules are 700 to 6000 times smaller than the approximate size of oil filter pores. Obviously, if the oil flows unimpeded through the filter elements, so does the ZDDP. Conversely, if an oil filter were trapping ZDDP and oil molecules, it would soon become clogged and cause the engine to be ruined catastrophically due to lack of lubrication. A method of actually testing the ZDDP filtering myth is to analyze the retained oil in the inlet side of an engine oil filter which has been in use for 3000 miles, and compare it to the original oil fill. Figure 5 shows a partial elemental analysis of ZDDP bearing oil before and after being run in this engine. The oil for the post analysis was removed from the inlet side of the filter. The ASTM D-5185 analysis results show the amount of phosphorus and zinc are the same, within sampling and experimental error.4 The obvious conclusion is the zinc and phosphorus does not leave the sump in the 3000-mile duration of an oil change. ZDDP, most definitely, does not get trapped by or accumulate in the filter. For a graphic illustration of the size difference between a ZDDP molecule and the pore in the best oil filter available today, consider this: Imagine the ZDDP molecule as the size of the period at the end of this sentence. The pore in a 5 micron filter element would then be about the size of a 15″ wheel. To summarize, can the ZDDP molecule be trapped in a hole that is 1000 times larger than the ZDDP molecule itself?